Everybody wants a flawless complexion, right? Bramley Even Tone skin care is especially designed to care for your skin and promote an even skin tone. Formulated with a blend of vitamins (C, E, A & B5), carob tree leaf extract and oil control ingredients, this range helps lighten dark spots, reduce impurities that lead to problem skin and prevent blemishes. The inclusion of Bio-Pharm oil helps replace lost ceramides in the skin resulting in a healthier looking skin. Available at PEP stores. Visit www.bramleycosmetics.co.za for more information. 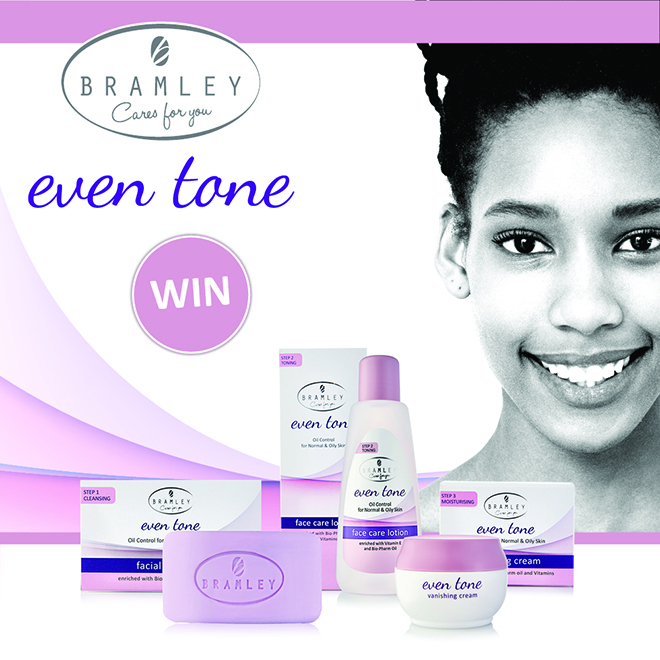 One lucky reader will win a Bramley skincare hamper worth R500. Simply complete the form and submit your details below. This competition is open to SA residents only and closes at 21:00 on 2 April 2019. Only one entry per participant will be taken into account for the prize draw. The winners will be drawn from all the correct entrants and notified via email. This prize cannot be exchanged for cash. BeautySouthAfrica.com’s decision is final and no correspondence will be entered into. We will not share your information with any third parties. If winners do not respond to email notification within three days, another winner will be drawn. BeautySouthAfrica.com will supply all hampers to the delivery company in good order, but will not be held liable for the condition of hampers arriving at the winners’ chosen delivery address. Please allow six to eight weeks for delivery. If you have won a prize on BeautySouthAfrica.com in the last two months, you are ineligible to win this competition.